Although I didn’t grow up doing it, probably due to my mother’s distaste for the main ingredient, it’s a tradition in the South to eat black eyed peas and some type of greens on New Year’s Day for luck and financial prosperity. The reputation of the pea’s luckiness supposedly dates back to Civil War times where they escaped being destroyed by Sherman’s troops because they were considered food fit for only livestock or slaves. It soon became a valuable food-source for the surviving Confederates. Eventually the practice of serving it with a type of greens (kale, collards, mustard, or cabbage) for financial gain became normal too. Now it’s common on New Year’s Day for my Instagram feed to be packed with photos of lunches consisting of peas and greens. I decided to change things up this year and after scouring the cupboards for inspiration settled on making pea burgers with a sautéed garlic kale topping. In a large bowl, mash the black eyed peas until a coarse paste forms. Stir in the next 10 ingredients (soy sauce through flour). In a large frying pan, bring the coconut oil to medium-high heat. Form the pea mixture into 4 patties. One at a time, fry the patties until golden brown, about 4 minutes on each side. Place cooked patties onto a paper towel lined plate to soak up any extra oil. In a small frying pan, bring the olive oil to medium-high heat. Add the minced garlic and cook until golden brown. Stir in the kale and cook until completely wilted. 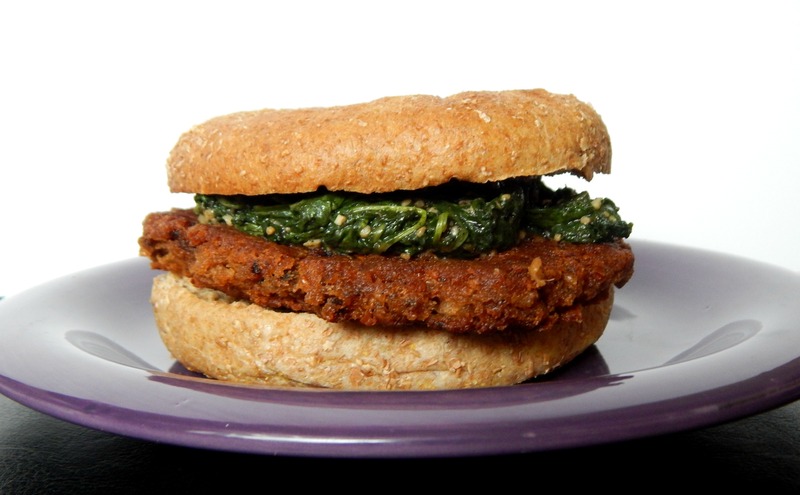 Form your lucky burgers by placing the black eyed pea patties, sautéed garlic kale, and any desired toppings on warm buns. And don’t forget to enjoy the new year!